Manila is one of the best and most interesting cities in Asia. It is a melting pot of history, culture, cuisines and attractions that lure millions of visitors every year. This tourist-friendly city is a destination for all types of travelers; it caters to different budgets, styles and preferences. Whoever you are and whatever your purpose for visiting Manila, you will soon find that the city reaches far beyond your expectations. It is never hard to find a suitable place to stay while visiting the city. While most accommodations are affordable, there are a number of 5 star hotels in Manila that cater to the luxuries of its affluent visitors. These properties are expectedly more expensive but guests will certainly enjoy all the perks of staying in a premier hotel while in the Philippines’ capital. If you’re planning to travel to Manila and stay in a premier hotel, we recommend you choose from the top-rated 5 star hotels in Manila that are listed below. The Pan Pacific Manila blends comfort and elegance to create a memorable vacation for its valued guests. This five-star property is located at the heart of Manila’s cultural and historic district and a short distance from convention, shopping and entertainment venues. Intramuros, Rizal Park and the picturesque Baywalk are minutes away from the hotel. Pan Pacific Manila is a business-oriented hotel with facilities for conferences and gatherings of a large number of people. The hotel also caters to leisure travelers by providing venues for relaxation and entertainment like the in-house spa and massage center, outdoor pool and spa tubs, and tour assistance. Guests enjoy luxurious accommodations with tasteful contemporary designs in Pacific tones. All 236 suites and rooms at this five-star hotel are equipped with top-of-the-line appliances and fixtures to ensure guests’ satisfaction at all times. Personal butlers are also at the guests’ beck and call during the entire stay. Manila Hotel is to Manila as The Plaza is to New York City. This five-star hotel at the heart of the city is a timeless landmark as well as a popular accommodation for affluent travelers visiting the Philippines. Manila Hotel is located within the city’s historic district, a walking distance from Intramuros, Rizal Park, the National Museum, Manila Cathedral and the National Library. Guests at the hotel are also close to the shopping and dining destinations of the business district. The hotel creates the perfect blend of elegance, modernity and traditional Filipino hospitality in its full range of winning amenities and well-appointed guestrooms. Guests are offered ultimate rest and recreation in the hotel’s full-service spa, health club and swimming pool with breathtaking views of the Manila Bay sunset. Business travelers also have the hotel’s conference facilities are their disposal. There are three in-house restaurants, Café Ilang-ilang, Champagne Room and Mabuhay Palace, all offering the best of culinary delights. 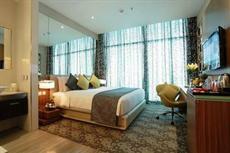 Guestrooms at the Manila Hotel are all designed with guests’ comfort in mind. Each room or suite is elegantly decorated and equipped with modern amenities to ensure a wonderful stay. En suite amenities include premium beds and linens, designer toiletries, MP3 docks, satellite televisions and beverage stations. Of the Hyatt standard of luxury and style, the Hyatt Hotel and Casino is one of the most popular 5 star hotels in Manila. The hotel is situated in a modern building standing very close to Manila’s tourist belt; Manila Bay, Luneta, Intramuros and Rizal Park are within a short distance from the property. World-class shopping is available at the expansive Mall of Asia and the adjacent Robinson’s Place. The Hyatt Hotel and Casino Manila provides guests a one-stop destination for entertainment and relaxation. The hotel features the huge Casino Filipino where guests can play the game of chance and The Spa @ Club Oasis that offers beauty treatments and relaxing massages. Guests also need not go far for gourmet meals as there are three onsite dining options: The Fireplace, Lili and Market Café. The hotel also features modern banquet and conference facilities for gatherings, occasions and corporate events. Guestrooms at this five-star Manila accommodation are designed with floor-to-ceiling windows opening to views of the city or of Manila Bay. Premium beds and linens ensure a peaceful and relaxing sleep. The private marble bathrooms at the hotel are stocked with signature toiletries, towels and robes. Other room amenities include kitchenettes and large LDC TVs with premium channels. Situated along one of Manila’s most picturesque roads, the Diamond Hotel is a perfect base for tourists exploring Manila’s historic and business districts. The hotel is close to major landmarks like the U.S. Embassy, Rizal Park, the Baywalk and the Supreme Court of the Philippines. The dining and shopping opportunities at Malate and Ermita are also within easy reach. 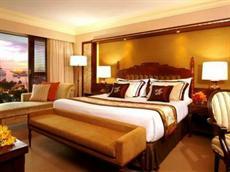 It is one of the best-rated 5 star hotels in Manila. 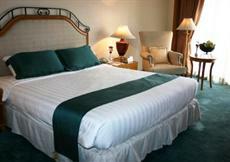 The Diamond Hotel offers its guests the ultimate rest and recreation experience during their stay. There is a full-service spa that offers beauty treatments and massages and three in-house restaurants that serve local and international culinary delights. Guests at this five-star hotel also enjoy such amenities as an outdoor pool, a modern fitness center, a business center and banquet facilities. All guestrooms at the hotel offer views of the city, the pool or Manila Bay. Comfort and style are markers of all rooms that are equipped with top of the line appliances and premium beds and linens. En suite bathrooms are spacious, well-decorated and provided with complimentary toiletries. High speed Internet access is available at a surcharge. Perhaps one of the most unique accommodations in the Philippines, Hotel H2O is an aquarium-themed hotel situated in the Manila Ocean Park Complex in Luneta. The first of its kind in the Philippines, the hotel provides luxurious accommodations for visitors of the oceanarium that features a walk-through aquarium and jellyfish light exhibits. The five-star property is also close to Manila’s historic district, with attractions like Intramuros, Manila Cathedral and the National Museum within easy distance. Hotel H2O boasts of a wide range of amenities like separate outdoor pools for children and adults, shopping center, an onsite dining venue and many more. Guests can also indulge in massages and beauty treatments offered by the in-house spa; the fish spa is something that guests should try at least once. There is also a modern fitness center for those who wish to use it. Tours around Manila and neighboring attractions may also be arranged through the hotel. Rooms at the hotel are aqua-themed, with views of the park or the bay. Some guestrooms have huge tanks with live fish that children of all ages will certainly enjoy. Complimentary beverages are available in all accommodations as well as free wireless Internet access and plasma TVs for entertainment. The Century Park Hotel is another one of the most popular 5 star hotels in Manila, centrally located to the city’s historic and business districts. The property provides easy access to everything Manila has to offer to its visitors: fine dining venues, spectacular entertainment, historic attractions, world-class shopping and the famous Manila Bay sunset. 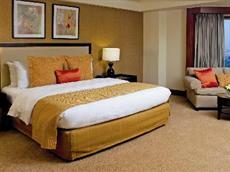 Guests at the Century Park hotel are also not far from the Ninoy Aquino International Airport. Hotel guests need not venture out to find a sumptuous meal as there are six in house restaurants and lounges that offer excellent fare. There is also a poolside bar where guests can enjoy snacks and drinks after a relaxing dip. Century Park Hotel also features a sauna, a health club, a gift shop, a snack bar and a tour desk. 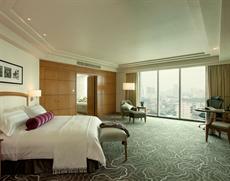 Rooms at this Manila accommodation are tastefully appointed and provide great views of the city, the sea or the pool. Guests can expect clean fully air conditioned rooms equipped with Internet access, cable TVs and personal safes. Complimentary toiletries are also available in all guestrooms’ spacious bathrooms.